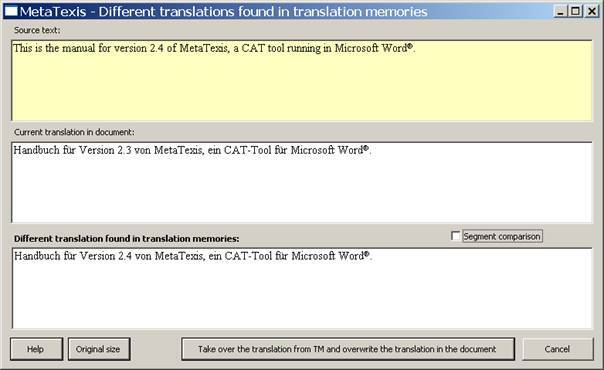 When the TM search is executed, if the TU opened has already been translated, it is checked whether the TM already contains any translation for the current source segment and if the translation differs from the current translation in the document. Note: This check is automatically executed, if the appropriate settings have been made in the dialog Document options (see the TM Search Options). The TM check can also be executed manually by executing the menu command MetaTexis | Translation memory (TM) | Search for source text in TMs (default shortcut: Alt+Ins). For more information, see the Searching in TMs. The yellow text box contains the source text. 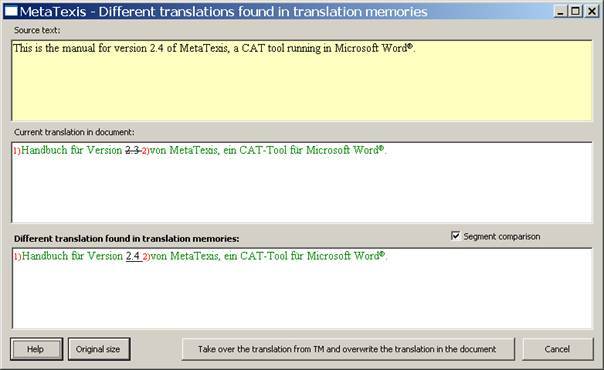 The second text box contains the current translation in the document, and the third text box contains the translation(s) in the TM(s) which differ from the translation in the document. To take over the translation from the TM, click the Take over the translation from TM and overwrite the translation in the document button. If you do not want to take over the translation from the TM, just click Cancel. When you then close the TU in the document and go to the next TU, the translation in the TM will be overwritten by the translation in the document. You can change the size of the dialog according to your needs. To go back to the original size, click the Original size button.